I followed you to the sun kuratiert von der in Berlin lebenden Ala Glasner, behandelt grundlegende Belange wie Zeit, Anfang und Ende, Konstruktion und Dekonstruktion – und stellt aktuelle Diskurse innerhalb der bildenden Kunst in Frage. Obgleich der Titel der Ausstellung I followed you to the sun einer Collage entstammt, ist er auch durch den utopischen Roman PLANET MAGNON des Deutschen Autors Leif Randt inspiriert. Tomás Saraceno kombiniert Einblicke aus der Raumforschung und aus Science-Fiction mit Geometrien, die sich in den biologischen Wissenschaften finden lassen, zu einer Wolken-Skulptur. Goshka Macuga, die mit ihren bronzenen Denker-Köpfen aus unterschiedlichen Epochen das Zeitgenössische einem historischen Kontext gegenüberstellt, zeigen wir eine Arbeit aus ihrer vielgepriesen Ausstellung ‚ "To the Son of Man Who Ate the Scroll", Fondazione Prada, Milan (2016). Arbeiten von Fiete Stolte und Jeremy Shaw, die zuletzt auf der Venedig Biennale 2017 zu sehen waren, greifen je einen bestimmten utopischen Ansatz auf: Während Stolte seine Woche in 8 Tage zu je 21 Stunden aufteilt und so unsere Realität in Frage stellt, untersucht Jeremy Shaws Video das Phänomen des Zeitsprungs. Die sich überlagernden, und zu- gleich gerenderten, geometrischen und organischen Muster in Daniel Steegmann Mangranés Arbeiten erinnern an den lateinamerikanischen Konstruktivismus und die Minimal Art und verweisen auf eine Konfrontation des von Menschen Geschaffenen mit dem Natürlichen. Mit ihrer großformatigen, ortspezifischen Installation verschiebt die italienische Künstlerin Diana Sirianni die räumlichen Grenzen und hinterfragt so die Idee der Konzeption von Ausstellungen. Die israelische Tänzerin und Choreographin Naama Ityel, deren Interesse körperlichen Übergängen gilt, präsentiert während der Sonderöffnungszeiten der Galerie ihre erste, galerie-basierte Lebendskulptur. Christian Falsnaes bearbeitet Fragen nach Kunst und Eigentum in seiner eigenen performativen Sprache und dokumentiert so einen kontinuierlichen performativen Prozess. Seine Ideen aus der Natur bezieht Maximilian Prüfer, der Pigmente aus Schmetterlingsflügeln extrahiert und so deren größtmögliche Abstraktion schafft. Der in Los Angeles lebende Künstler Rodrigo Valenzuela führt seine Erforschung der Einwanderungsgeschichte mit ästhetisch abstrakten, futuristischen Konstruktionen fort. 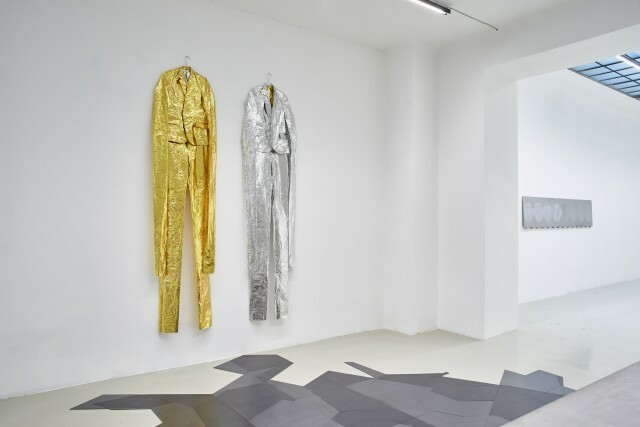 Curated by Ala Glasner, who lives in Berlin, I followed you to the sun discusses fundamental concerns such as time, beginning and end, construction and deconstruction - and questions current discourses within the visual arts. Although the title of the exhibition I followed you to the sun comes from a collage, it is also inspired by the utopian novel PLANET MAGNON by the German author Leif Randt. Tomás Saraceno combines insights from space science and science fiction with geometries found in the biological sciences into a cloud sculpture. Goshka Macuga, with her bronze thinker heads from different eras, juxtaposing the contemporary with a historical context, we show a work from her much praised exhibition, "To the Son of Man Who Ate the Scroll", Fondazione Prada, Milan (2016). Works by Fiete Stolte and Jeremy Shaw, most recently seen at the Venice Biennale in 2017, each adopt a specific utopian approach: while Stolte divides his week into 8 days of 21 hours each, challenging our reality, Jeremy Shaw´s video examines the phenomenon of the time jump. The overlapping, and at the same time rendered, geometrical and organic patterns in Daniel Steegmann Mangrané's works are reminiscent of Latin American Constructivism and Minimal Art and point to a confrontation of man-made with the natural. With her large-format, site-specific installation, the Italian artist Diana Sirianni shifts the spatial boundaries, questioning the idea of ​​designing exhibitions. The Israeli dancer and choreographer Naama Ityel, who is interested in physical transitions, presents her first, gallery-based living sculpture during the special opening hours of the gallery. Christian Falsnaes works on questions of art and property in his own performative language and thus documents a continuous performative process. His ideas from nature are sourced from Maximilian Prüfer, who extracts pigments from butterfly wings and thus creates their greatest possible abstraction. Los Angeles-based artist Rodrigo Valenzuela continues his exploration of immigration history with aesthetically abstract, futuristic constructions. Bienal de Cuenca, Ecuador (2014). Biennial for Young Art, Art Berlin Contemporary, Art Basel and recently at Biennale in Venedig (2017). Viva-Preis. She was rewarded the Kunstpreis Haus am Kleistpark in 2015.
speaker, he often commands his audience to carry out his planned performance. His work deals with issues of hierarchy, power and the question of authorship. Time/Line/Movement is taken from a series of drawings which always depicts a copy of the original work. Falsnaes studied in Copenhagen and Vienna. His first large-scale solo exhibition FORCE is on view until June 24 2018 at the Kaiser Wilhelm Museum in Krefeld. Christian Falsnaes’ work has been presented in various group exhibitions worldwide, including the Centre Pompidou, and at 21er Haus, Vienna (2017). Falsnaes was nominated for the Future Generation Art Prize (2017) and the Preis der Nationalgalerie (2015). of the world. Prüfer has been working on the development of his own new printing system: „Naturantypie“. Using it he is able to illustrate the slightest movements such as the wing beats of butterflies, moths and wasps as well as the traces of ants or snails. Prüfers research and images are never circumscribed solely by the natural, uncontrolled movements of the insects. Often he guides their ways by using scent marks, baits and containments - for instance by invading the territory of ants or with the aid of light sources with moths - and makes the principles of the emergence as image-producing (bildschaffend) factor visible. Until now unseen imageries provide completely new intellectual approaches. Prüfers oeuvre has been recently shown at Museum Villa Rot, Burgrieden 2018, Sotheby’s Munich and at Neue Galerie im Höhmannshaus, Augsburg. spider webs, cellular layouts and astronomical planning. Saraceno has not only been awarded several prices such as the Alexander Calder Prize (2009), but has also been exhibited almost everywhere, including Austrian institutions like 21er Haus, Österreichische Galerie Belvedere: Becoming Aerosolar (2015). Famous solo exhibitions include In Orbit, K21 – Kunstsammlung Nordrhein Westfalen, Düsseldorf (2013- ongoing) and Cloud Cities, Hamburger Bahnhof- Museum für Gegenwart, Berlin (2011). One of his upcoming and most prestigious solo shows in 2018 will take place at the Palais de Tokyo, Paris. Jeremy Shaw Born 1977 in North Vancouver, lives and works in Berlin. Incorporation of photography, video as well as performance, often using found material and framing a contextual search for visible borders dealing with the topic of neuroscience, are explorations in Jeremy Shaw’s body of work. Transitions between the presence and the future, different realities and dreams can be found in his ongoing work: “This transition never ends” which deals with the phenomenon of time slippage. In 2018 Shaw will be showing at the Kunstverein Hamburg (solo) as well as at the Tate Modern (Trilogy Screening). He is currently an artist in residence at the Hammer Museum. Recent presentations include How To Live Together, Kunsthalle Wien (2017) and the 57th Biennale: Viva Arte Viva. a BA in philosophy at Evergreen College and MFA at University of Washington in 2012. Since autumn 2017 Valenzuela is an assistant professor at UCLA in the department of art. Valenzuela’s photography, video and installation work is based on staged situations as well as digital interventions and is rooted in the contradictory traditions of documentary and fiction, often involving narratives around immigration and the working class. In a multi-stage reprography process Valenzuela projects abstract lines on unenlivened desert scenes, which point to yet to be built houses, offices and memorial sites. Valenzuela’s labour intensive practices refer to the bureaucratic process of applying for citizenship in the USA, of which he is familiar personally. Recent solo exhibitions include Jordan Schnitzer Museum of Art, Eugene (2018), Art League Houston (2018), Portland Art Museum (2017), McColl Center, Charlotte (2017), Frye Art Museum, Seattle (2015). Valenzuela’s works have been included in following group shows: Center for Contemporary Art, PNCA, Portland (2018), The Drawing Center, Frye Art Museum, Jubilee Park and Community, Tacoma Art Museum (2017). photography as a transformation into an object- like three-dimensional ‘thing’ rather than as photography itself, bringing together collages, memories and excerpts from books which he deconstructs or renders to be unrecognizable. He is inspired by a biologist whose work on the origin of cells helped transform the study of evolution. Lacler’s transformed jellyfish and various objects are washed up on to the beach: each piece is a unique work. Moritz Lacler has recently finished his studies at the University of Arts, Berlin as Manfred Pernice’s student. This is his first exhibition in Vienna. bringing together the best minds for discussions of global topics. Group shows include dOCUMENTA (13), Kunsthalle Fridericianum, Kassel, Germany and Queen’s Palace, Kabul, Afghanistan 2012. Born 1987 in Tel-Aviv, lives and works in Berlin. Israeli dancer and choreographer debuts with a piece especially developed for ‘I followed you to the sun.’ In Presentation of present, she questions what would things look like if we cut out the future and the past. Performers : Anna Jarrige and Daphna Horenczyk.